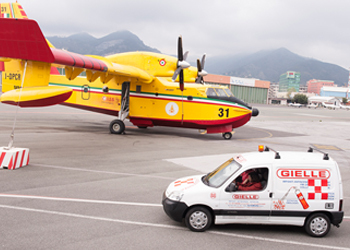 Gielle does not only design, supply and install some of the most technically advanced fire suppression systems available, we also test and maintain equipment to check your system is capable of responding to a fire emergency. Your gas suppression system will only work effectively if the room containing your IT or electronic equipment has only limited leakage. If the room leaks, the fire suppression agent will escape before the fire is effectively controlled. 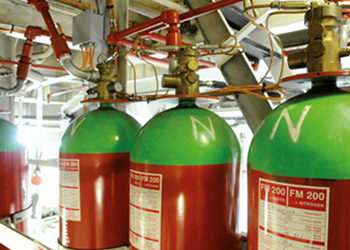 With any gas fire suppression system – such as Inergen, Novec or FM200 – the room must be sufficiently air tight to hold these gases at the designed concentration while they suppress the fire. Building joints and cable penetrations move over time introducing leak points that may not be noticed during normal building inspections. Building maintenance activities may also inadvertently create places where gases can leak. That is why World Standard AS1851-2005 “Maintenance of fire protection systems and equipment” requires an Enclosure Integrity Test each year. Vigilant facility managers take their duty of care seriously and checks that all parts of the fire detection and suppression system are ready to respond to protect critical assets. The Gielle extinguishing solutions comprise a comprehensive service portfolio: We support you from risk assessment, application support, system design, installation, and commissioning to maintenance and modernization. This also includes, for example, the Gielle Door Fan Test, which tests a flooding zone for leakages and thus proves the extinguishing efficiency of the system. Quick and reliable extinguishing can be accomplished by building up and maintaining the required extinguishing concentration for a certain time. The room to be protected, therefore, needs to be sufficiently airtight. The Gielle Door Fan Test from Gielle offers a simple, cost-effective, and environmentally friendly method for measuring room tightness and can also be used to directly locate leaks. Extinguishing systems put out a fire quickly and reliably if the necessary extinguishing concentration can be built up rapidly and maintained for at least 10 minutes. For this to happen, the rooms to be protected must be sufficiently airtight. measurements on an annual basis. The Gielle Door Fan Test from Gielle offers a simple, cost-effective and environmentally friendly method for measuring room tightness – and can also be used to directly locate leaks at any time. determine the holding time of the extinguishing concentration. To test a room, a fan is placed in the entrance door. It blows air into the extinguishing area or removes air from the room, creating an overpressure or partial vacuum of approx. 50 Pa, and allowing any leaks to easily be located. Based on the delivery rate of the fan, special software then determines how much air must be discharged into the room to maintain the generated pressure. At a low flow rate, the leakage volume is low, and at a high flow rate, the leakage volume is high. The software quickly provides an exact result – just a few parameters are needed. Any existing leaks at openings for cables and pipes, at windows, doors or ventilation equipment or at other locations in the room can be easily detected using a smoke simulator. Once located, these leaks can usually be easily and specifically sealed. The Gielle Door Fan Test should be performed prior to every initial installation and then repeated at regular intervals – because buildings age, rooms change, new cabling is installed, and seals lose their effectiveness. Annual testing ensures that new leaks are discovered and can quickly be eliminated. The Gielle Door Fan Test is set up and taken down quickly – and delivers fast results. Moreover, the test doesn’t interrupt ongoing operations in the room to be protected, preventing any production losses or delays in order processing. The Gielle Door Fan Test makes it possible to measure room tightness without actual discharge of extinguishing agents. That saves time and money. 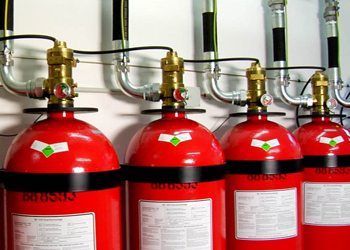 Moreover, the extinguishing system remains fully functional throughout the test – there are no downtimes as a result of empty extinguishing agent cylinders or the need to refill them. The Gielle Door Fan Test meets the requirements of the ISO 14520 standard, which specifies that rooms equipped with gas extinguishing systems must be tested upon start-up of the systems. Moreover, testing is either required or recommended by most certification institutes. There are two types of blower doors: calibrated and uncalibrated. It is important that auditors use a calibrated door. This type of blower door has several gauges that measure the amount of air pulled out of the house by the fan. Uncalibrated blower doors can only locate leaks in homes. They provide no method for determining the overall tightness of a building. The calibrated blower door's data allow the auditor to quantify the amount of air leakage and the effectiveness of any air-sealing job.